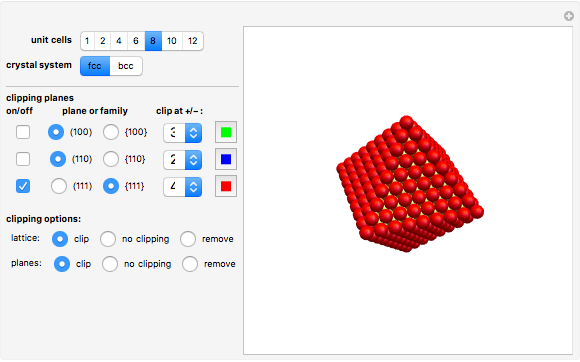 This simple Demonstration is used in our course "Foundations of Materials Science" to help students visualize the orientation and structure of various low index planes for the face-centered cubic and body-centered cubic crystal structures. 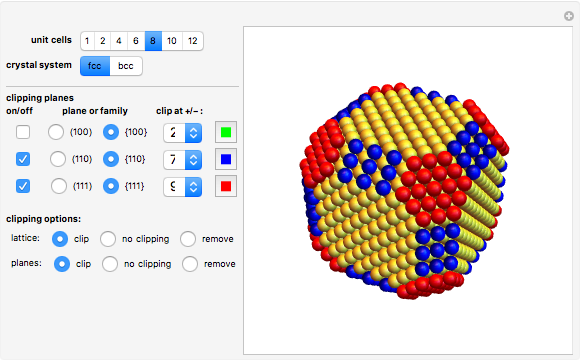 This Demonstration has a simple interface but hopefully provides enough flexibility to explore the cubic crystal structure in detail. The interface also allows for simulating basic facetting structures that are observed during the growth of "kitchen crystals" such as alum. I have used many excellent programs  in my courses at Virginia Tech while teaching basic crystal structures in our undergraduate foundational materials science class . However, I often needed to tailor the output of the visual on the fly to accommodate student questions. The result of trying to answer similar questions over the past several years prompted me to write this simple Demonstration in Mathematica. This current version only gives options for the FCC and BCC crystal systems but can be easily extended as needed. The clipping options, although simple, surprisingly allow for a number of different visualization options that I have found able to answer most questions asked of students at this introductory level. 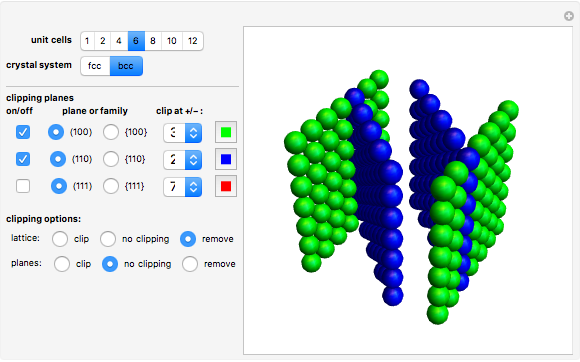 For example, the freeware by Stephen Michael Schimpf, "Crystalline Solids," version 2.0.1, copyright 1997–2005, The Regents of the University of California. MSE2044 Fundamentals of Materials Science, Virginia Tech. Text book: W. D. Callister, Materials Science and Engineering An Introduction, New York: John Wiley & Sons, 2007. Sean G. Corcoran "Basic Structure, Plane Orientation, and Facetting in the Face-Centered and Body-Centered Cubic Crystal Structures"